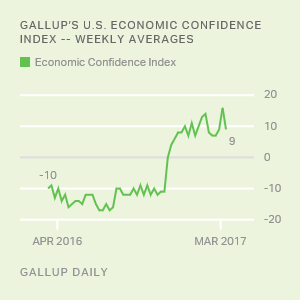 WASHINGTON, D.C. -- Gallup's U.S. Economic Confidence Index remained firmly in positive territory at +11 for the week ending March 19. The score is in line with most weekly results since Americans' economic attitudes improved in mid-November, but is five points below the index's nine-year high reached two weeks ago. Though the index exhibited gradual, if uneven, progress over most of Barack Obama's presidency, it turned positive shortly after Donald Trump's election last November and has since remained positive for 18 consecutive weeks. 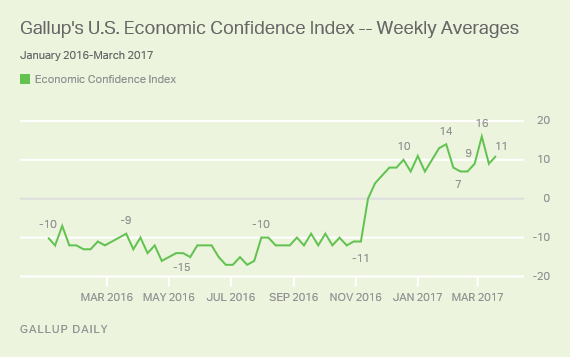 This is the longest period of positive economic confidence since Gallup began daily tracking in 2008. A number of factors, some political, help explain Americans' stronger and sustained confidence in the economy. Politically, no group's faith in the economy has recovered as sharply as that of self-identified Republicans. During the Obama years, Republicans were deeply pessimistic about the state of the economy -- with weekly U.S. economic confidence often in the negative 40s, 50s and even 60s. It stood at -43 the week before the 2016 election. With Trump in office and Republicans in control of Congress, their confidence is nearly 100 points higher -- +46 last week, for instance. Meanwhile, although Trump is a controversial president with low job approval ratings, many Americans see him as a president who can help make the country prosperous. At the same time, new political realities may not solely be responsible for the better economic perceptions. Many measures of economic growth have seemed to pick up steam of late -- U.S. GDP grew over 2% in the last six months of the year compared with the first six months of the year, higher than the typical level of growth since 2009. Meanwhile, the U.S. has added over 200,000 jobs to the economy in January and February of this year, and the current unemployment rate stands at 4.7%, one of the lowest rates in years. 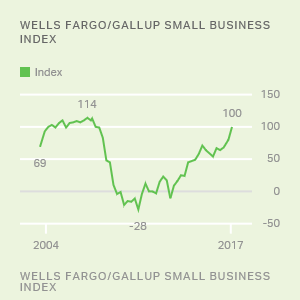 The stock market, meanwhile, has performed strongly this year and the Wells Fargo/Gallup Small Business Index is as high as it has been since July 2007. The Federal Reserve gave its own vote of confidence in the economy when it decided on Wednesday to raise its benchmark interest rate by a quarter-point. This was the second rate increase in three months, a sharp change from the previous eight years when nonexistent or persistently low economic growth persuaded the Fed to keep interest rates near zero. In light of the positive economic news, the current conditions component of the index was +17 last week, based on 35% of Americans saying the current condition of the economy is "excellent" or "good," and 18% saying it is "poor." That exceeds by one point the nine-year high of +16 two weeks ago. Americans are less optimistic, however, on the future direction of the economy, with 49% saying economic conditions as a whole in the U.S. are "getting better," and 45% saying they are "getting worse." This leaves the economic outlook score at +4 for the week, quite a bit lower than the +15 achieved two weeks ago. Fed Chair Janet Yellen expressed the Fed's confidence in the "robustness" of the U.S. economy last week, further suggesting it has shaken away the sluggishness that has characterized its performance in the years after the Great Recession. 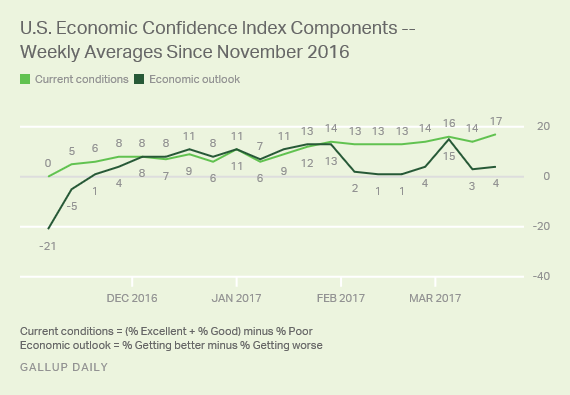 Along with the Federal Reserve, Americans remain confident in the economy, with Gallup's U.S. Economic Confidence Index at levels close to nine-year highs. Although few find any fault with the economy's present performance, the country is more divided on the direction in which the economy is headed. Results for this Gallup poll are based on telephone interviews conducted March 13-19, 2017, on the Gallup U.S. Daily survey, with a random sample of 3,564 adults, aged 18 and older, living in all 50 U.S. states and the District of Columbia. For results based on the total sample of national adults, the margin of sampling error is ±2 percentage points at the 95% confidence level. All reported margins of sampling error include computed design effects for weighting.